Srimad Bhagavata Saptaha Mahotsavam 2012 at Houston Namadwaar was indeed a grand celebration and an experience that will be cherished deeply for years to come by all the devotees who attended the event. Held from Dec 21 to Dec 28 under the guidance of Sri Ramanujam ji, the event was really a “Mahotsavam” with so many activities taking place simultaneously, each of them geared towards immersing us in joyful smaranam and celebration of Bhagavan. 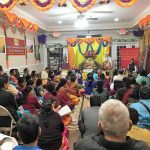 Almost a 100 devotees from all across the USA visited Houston for the event, including from Atlanta, California, Chicago, Corpus Christi, Dallas, Florida, Indiana, Minneapolis, Michigan, Seattle and Virginia. The Utsavam began on Friday, Dec 21 at Namadwaar with “Ghata stapanam”, the auspicious installation of deities in a sacred silver vessel. Parayanam (recitation) of Srimad Bhagavata Mahatmyam was then completed on the same day. 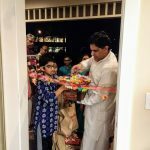 That evening, Sri Ramanujam ji’s 7-day Srimad Bhagavata Saptaha discourse also began at Sri Meenakshi Temple in Pearland, TX which was jointly presented by G.O.D. with Meenakshi Temple Society. After the discourse, Dolotsavam (lulling the Lord to sleep) was performed with Sri Sri Muralidhara Swamiji’s kirtans, back at Namadwaar. 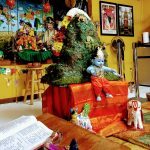 The next morning, Dec 22, began bright and early with Prabodhanam (waking up the Lord with kirtans) followed by Tiruppavai chanting and the commencement of the first day of Srimad Bhagavata parayanam. This was followed by Unchavruthi (offering of rice to a householder bhagavatar) amidst the singing of bhajans. Then it was time for Purappadu (procession) of the Lord around Namadwaar. 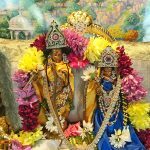 Sri Premika Varadhan and Sri Madhuri Sakhi, and Sri Swamiji were seated on a beautifully decorated palanquin and, led by Sri Ramanujam ji, were taken on a circumambulation of Namadwaar as devotees sang kirtans composed by Sri Swamiji. It was indeed a divine atmosphere that was enjoyed immensely by all. Following this, pooja and neivedyam were offered to the Lord. Sri Ramanujamji’s Bhagavatam katha was held early in the afternoon that day on account of the G.O.D.’s fundraiser concert, Melody of Compassion, which was to be held that evening. After the concert event, which was a huge success, dolotsavam was performed at Namadwaar to give the Lord some rest. From the next day onwards, major activities were held at approximately the same time… prabodhanam, tiruppavai and Bhagavata parayanam commencement from 5:30 AM onwards, unchavruthi around 8: 30 AM, purappadu around 10 AM, neivedyam and harathi around 12 noon, Ashtapathi bhajans in the afternoon between 1 and 3 PM, Madhura Smrithi by various devotees around 4-5 PM, Ramanujam ji’s Bhagavatam discourse at 6:30 pm at Meenakshi Temple which was preceded daily by Madhura Gitam song and dance performances by local students and artistes, and finally dolotsavam at 10 PM. 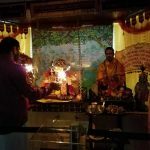 Sunday, Dec 23rd was Vaikunta Ekadasi. On this auspicious occasion, a 24-hour Akhanda Mahamantra Sankirtan was started at 9 AM, which went on until 9 AM the following day. A special Garuda Vahana purappadu was the highlight of the day. The weather was beautiful with a cool breeze gently caressing the Lord who looked majestic in the palanquin with a huge, devout Garuda in front. Sri Swamiji’s beautiful kirtans filled the air as devotees drank in the beauty of the Lord and followed Him around Namadwaar. The Madhura Smrithi session that afternoon was by Smt. Padma Venkatramani ji who is an old, long-time devotee of Sri Swamiji. She shared several memorable, endearing experiences with Sri Swamiji from the old days when He was very accessible and surrounded by only a fortunate few. Another special event for Vaikunta Ekadasi was the Divya Namam which was held that night, when devotees walked and danced around Lord Krishna as Divya Nama Sampradaya bhajans were sung. As parayanam continued through the day, the different “avatarams” and “lilas” of the Lord were celebrated with special neivedyam offerings. Ashtapathis and sampradaya bhajan singing every afternoon was led by Ramanujamji, Ramyaji, Umaji and Aparnaji. Devotees who had the fortune of sharing their Madhura smrithi experiences, apart from Padma ji, included Narayanaswamy ji, Kishore ji, Jeevan ji, Sriram ji and finally Ramanujam ji himself on the final day. On Dec 26th evening, Janavasam utsav was performed for the Divine Couple who were to have their marriage ceremony the following day. The same night, Mahila Divyanamam by satsang ladies was performed with kirtans of Sri Swamiji. Dec 27th was the busiest and most active day. The events started early with the usual daily prabodhanam, Tiruppavai and Bhagavata parayanam. Alongside these, on that day, Hanuman Chalisa was chanted 108 times. Then the much-awaited, grand Radha Kalyana Utsavam began with the singing of bhajans and namavalis, Ashtapathis including the Kalyana Ashtapathi, chanting of churnikai slokas and lagnashtakam, and finally the tying of mangalyam symbolizing the wedding of the Divine Couple. More kirtans were then sung including several of Sri Swamiji’s beautiful prayer kirtans that invoke the Lord’s grace on all His devotees. After a sumptuous neivedyam for the Divine Couple, it was time for the wedding feast for all the devotees. In the afternoon, Bhagavad Gita parayanam was performed, which was followed by the much awaited Madhura Smrithi by Ramanujam ji, where he shared several of his experiences with Sri Swamij. That evening was the final day of the Bhagavata Saptaha discourse by Sri Ramanujam ji at Sri Meenakshi Temple. A crowd of around 150 people had attended the discourse every day and enjoyed the wonderful nectar of Srimad Bhagavatam. Dec 25 – Radha Kirtans – Bharatanatyam by Surabi Veeraraghavan and a Christmas special song on Sadhus of India by children of Gopa Kuteeram. Back at Namadwaar, on Dec 28th morning, which was the final day of the Mahotsavam, Srimad Bhagavata parayanam (18000 slokas over 7 days) was completed with the recitation of the 12th and final Canto. Bhagavad Gita parayanam was also completed. Finally Anjaneya Utsav and Vidayatri celebrations were done to bring the grand event to a wonderful conclusion. 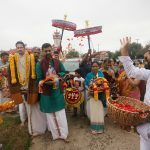 Over the next few days, all out-of-town devotees left Houston with a heavy heart that the wonderful event–which was so reminiscent of Sri Swamiji’s own Brahmotsav celebrations at Madhurapuri ashram — was over all too soon! However, everyone was filled with fond memories of immersing in the bliss of satsang and celebration of the Lord, which would keep them going until the next Utsav.